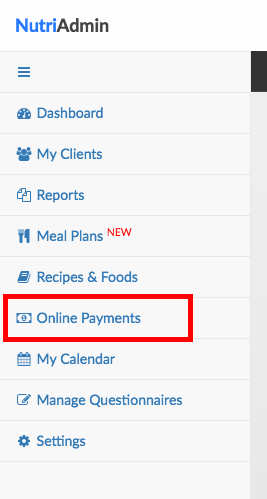 When you sign up for NutriAdmin, you can link to a Stripe account so that you can process online payments from your clients with ease. 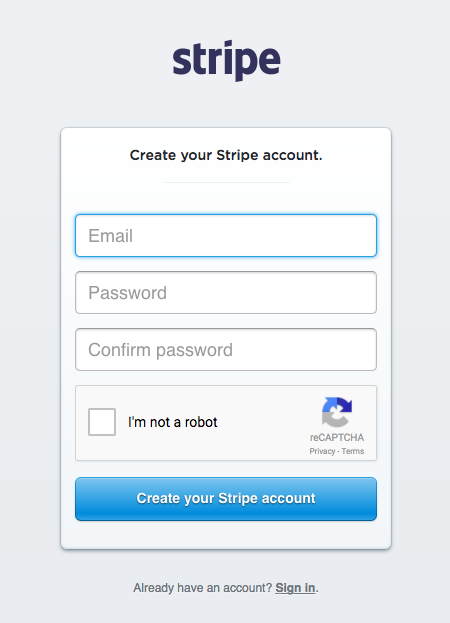 Setting up an Stripe account is easy, and should take you 10–15 minutes. All you have to do is to fill up a form and to verify your identity. 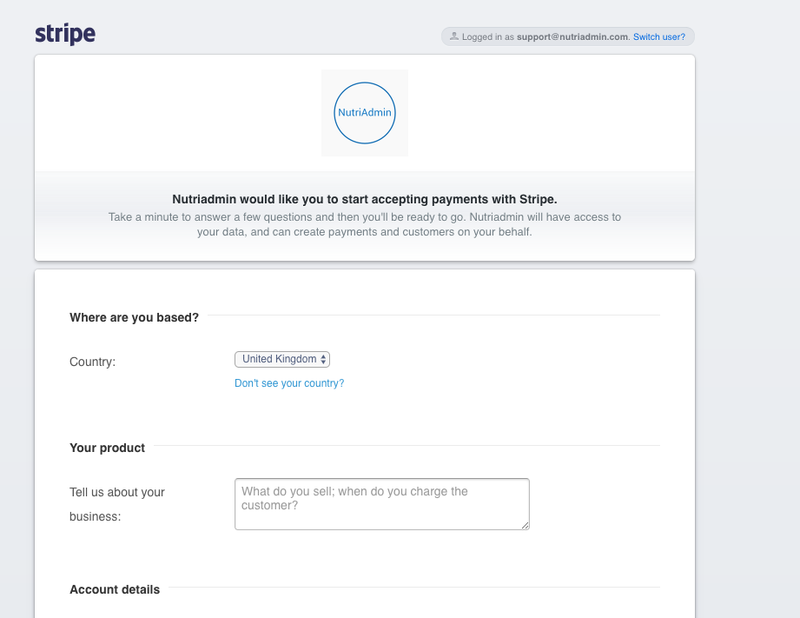 This article will show you how to setup your Stripe account with NutriAdmin step-by-step. Step 1: Click on the Online Payments item in the side menu. 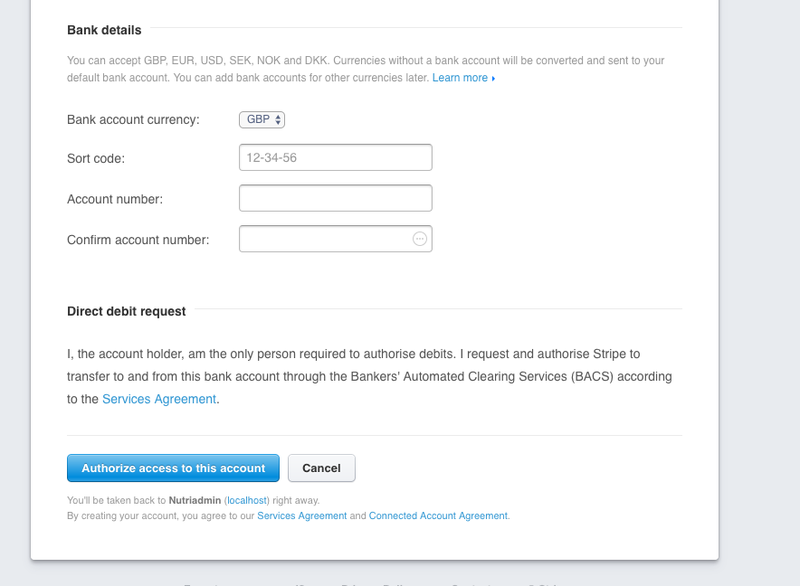 Step 2: If you haven't setup your Stripe account yet, you will see a screen like the one below. Click on the Connect with Stripe button to get started. If you already have a Stripe account, you can enter your email/password to login. This will automatically link your NutriAdmin account to Stripe and the setup process will be done. 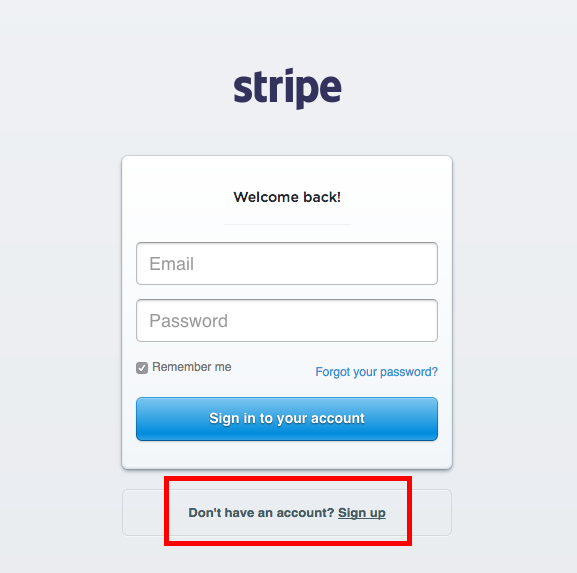 If you do not have a Stripe account yet, you will need to click on the Sign up button highlighted below. Step 4: Enter your email and new password to create your account. The password does not need to be the same as in NutriAdmin. It is recommended you choose a very strong password, since Stripe will be managing some of your financial data and payments. Step 5: After entering your email/password, you will be presented with a form with a few different sections. You will need to fill in the majority of the fields in the form, although some of them are optional. Firstly, select your country from the dropdown menu. Stripe supports many countries, including all major English-speaking countries, so the majority of NutriAdmin users should be able to find their country in the list. The above said, if your country is not in the list, it may be that Stripe does not support your country yet. If that's the case, you will unfortunately not be able to use Stripe to process payments. You can always contact Stripe to enquire when they will support your country. Stripe is expanding to cover more and more countries at a fast pace. Step 6: Enter your business type (e.g. company or individual), business address, and website. Please enter your personal website (not nutriadmin.com or stripe or another website). Step 7: Enter your personal details. Stripe will need to verify your identity for security reasons (typically they will request a copy of your passport, more on this later) so it's crucial to make sure all your details are entered accurately. 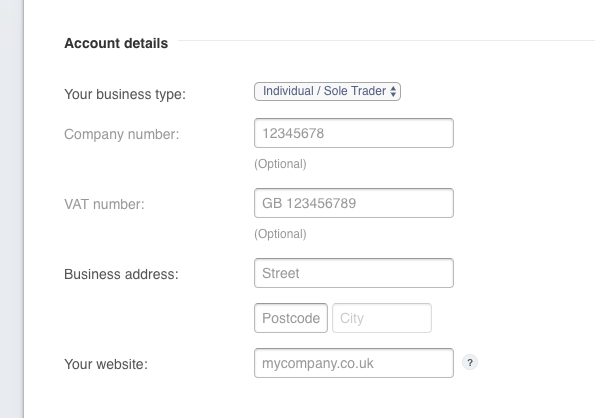 You must also enter your business name and phone number as it will show in your clients' receipts and statements. Make sure your clients will be able to identify charges to their account as coming from you. If a client is unable to clearly identify your name in their card statements, they may request a refund. 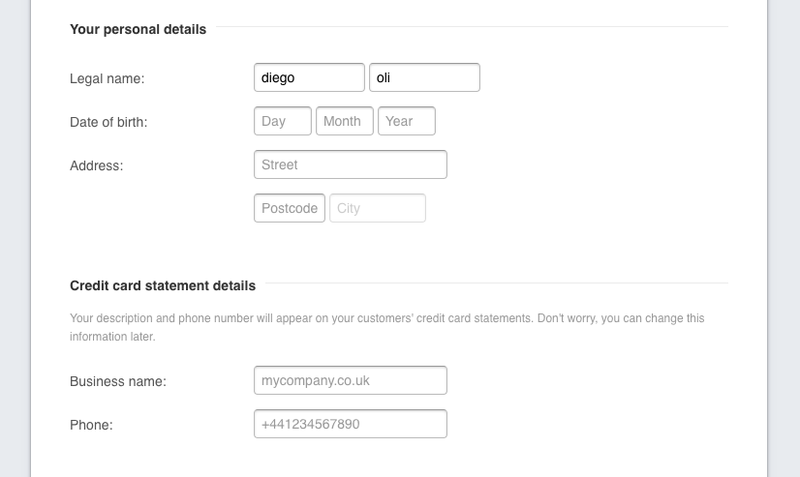 Step 8: Enter your bank details. Stripe will send your collected funds (minus their fees) to your specified bank account in the currency of your account. When you are done, click on Authorize access to this account. If there are some errors in the form, the website will prompt you to correct them. Otherwise, your account will be created and you will be set to go. After login in to Stripe (or creating a new account) you will be redirected to NutriAdmin and your account will be linked. You will need to follow any instructions included in Stripe's welcome email. Typically, you will be asked to submit a copy of your passport/national ID so that your identity can be verified. Stripe takes security and anti-fraud measures seriously, so you will need to comply with their requirements if you want to use the service to take live payments. The good news is that the process of verifying your account should be simple (sending your ID will probably be enough in most cases). Stripe is famous for making it extremely easy to get started with them. It may take you 10 minutes to fill in their form, and then it may take a couple of days for your account to be active for requesting payments from clients (the time it takes them to verify your ID) but after that you will be set to use the software. Other online payments companies can take weeks to create and setup your account. Finally, you can always check Stripe's documentation and support pages if you have any questions about their service or account setup process.